Indigenous leaders appear to join forces with Hindu nationalists to assault Christians. HYDERABAD, India (Morning Star News) – When Hindu extremists in India told pastor Karma Oraon they would not stop beating him until he worshipped the monkey god, he felt Christ close to him, he said. 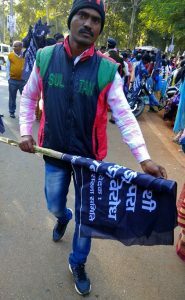 His small flock of eight people was meditating on Scripture on Christmas Eve at 10:30 a.m. in Harmu village of Ranchi District, Jharkhand state, when twice as many Hindu nationalists brandishing wooden stick intruded, shouting, “Praise Bajrang Bali.” Bajrang Bali is another name for the popular monkey god Hanuman. As he was dragged out by the collar, one of the Hindu extremists video-recorded the scene, also asking his accomplices to record, forward and circulate the video, sources said. The Hindu extremists repeatedly asked the pastor his name, refusing to believe him, as his name is typical of area tribal people who practice indigenous religions, not Christianity, he said. They called him an idiot, slapped him and told him to stop lying, and when he showed them his national identification card, they tore the original document to pieces, Pastor Oraon said. They kicked him and expelled him from the village, he said. That night at 10 p.m., he went to a police station, but officers refused to register a case against the assailants or even receive his complaint, he said. In a separate incident in Jharkhand state, another group of Hindu extremists beat tribal Christians while they worshipped – also reviling them for leaving their indigenous religion for Christianity. 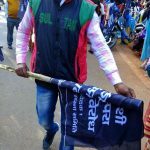 About 60 Hindu nationalists stormed into a house church on Christmas Day in Behratoli village, Ranchi District, where 16 Christians had gathered to celebrate Christmas. They arrived on 25 motorcycles, slapped him and asked him his name to determine his indigenous heritage, he said. When they tried to light a match to set the torn Bible on fire, they were unable to ignite it, he said. Jeevan Munda, at whose house the worship service was held, was also injured in the attack. That night Pastor Tirkey went to a police station to file a report, but officers refused to accept his complaint, the pastor said. He became a Christian eight years ago. Then an alcoholic with declining health that no doctor was able to relieve, he was healed after putting his faith in Christ, he said. Pastors Oraon and Tirkey belong to the Believers Eastern Church. The Rev. Somnath Honhaga, Believers Eastern Church secretary of the Diocese of Chakradharpur, told Morning Star News that religious freedom in Jharkhand is in danger. The growth of Christianity in Jharkhand state has also brought increasing attacks by Hindu nationalist groups, Honhaga said. Unable to get police to register their cases, the two pastors have filed First Information Reports online, though there has been no progress in the investigations, Honhaga told Morning Star News. Indigenous leaders on Dec. 24 raised black flags in parts of Jharkhand in protest of rising Christianity and “Western culture,” and Christian leaders suspect indigenous Sarna advocates supported by the Hindu extremist Rashtriya Swayamsevak Sangh (RSS) were behind the attacks. The Central Sarna Committee (Kendriya Sarna Samiti) of Jharkhand state issued a press release demanding the government enforce the state’s “anti-conversion” law. The law passed last year bans forcible or fraudulent conversion, though comments by Hindu nationalists indicate they mistakenly take it to mean it bans any conversion from Hinduism. People convicted of fraudulent or forcible conversion can be punished by prison terms of up to three years in Jharkhand state, or up to four years if the person fraudulently or forcibly converted is an indigenous tribal known as Adivasi. Adivasis are entitled to government benefits. The Constitution of India recognizes tribal populations who are original inhabitants of a given region as Adivasi regardless of their religious beliefs, a constitutional expert who requested anonymity told Morning Star News. “There is potential threat to the Christian converts from those who believe in the deep-rooted casteism,” the source said. During the Dec. 24 protest, Sarna activists were reported to have taken an oath to disrupt Christmas celebrations, according to local media reports. The smaller churches were attacked, he noted. The Hindu nationalists cannot abide tribal people rising to higher positions, he said. Adivasi Christians in Jharkhand requested prayers for freedom to worship. India ranked 11th on Christian support organization Open Doors’ 2018 World Watch List of countries where Christians experience the most persecution, up from 15th the previous year, and ahead of Saudi Arabia, Nigeria and Egypt.